Looking to get a new ATM or get with a new ATM company? You have come to the right place. We are a private non-bank independent ATM operator that specializes in ATM placement and cash management for high volume locations and offer a full range of ATM services nationwide – in both the US and Canada. Yes, that’s right – nationwide. We operate the largest network of technicians and cash loaders in the country that has been curated over many years. We literally have people in every major metro area of the US and Canada (well, the metro areas of English speaking Canada anyway). 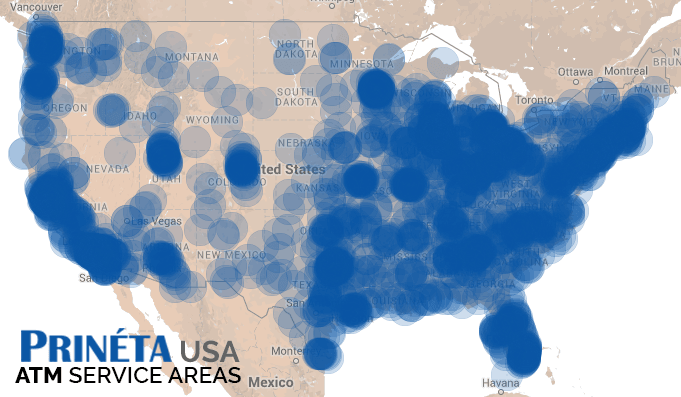 View some of our larger markets on this interactive map. Being able to provide service nationwide gives us a unique advantage over other ATM companies. As a result of our expansive reach and excellent reputation (especially with the hospitality & tourism industries), we are one of the fastest growing and most recognized ATM companies in the country. We offer free ATM placement and management for qualified locations and ATM sales with processing for clients that prefer to take care of the machine themselves. We are experts in the ATM business and known for unparalleled expertise, service and support. We never let our machines run out of cash or be down for any extended period of time. We have a good reputation (with many great reviews) and maintain an A+ Rating with the BBB. Whether you are looking for one ATM for a single location or an ATM vendor capable of servicing a corporate chain with operations in multiple states, we can customize services and get you exactly what you need. We are passionate about ATMs and would like to be your ATM company. If you have a high-traffic establishment we’ll put one of our ATMs in your location for free, take care of everything, and pay you for it. The full-service ATM placement is a completely hands-off, hassle-free program with no financial commitment, making it our most popular option. Locations that are busy or have heavy foot traffic will likely qualify. If you load the ATM with cash, then we will buy and manage the ATM and split the surcharge revenue with you 50/50. Our merchant-loaded ATM partnership is a minimal hands-on program with no financial commitment, making it a popular option for independently owned businesses that don’t want to make a large upfront investment or the full responsibility of maintenance, but don’t mind cash-loading in exchange for more of the surcharge revenue. If cash is not a problem and you would rather buy an ATM and make most all the money? We make buying an ATM easy and take care of setting up the ATM processing for you. We are an authorized Hyosung, GenMega, Triton, and Hantle master dealer/distributor with a network of nationwide ATM technicians and installers. We are an authorized GenMega, Hyosung, Triton, and Hantle master dealer/distributor. We primarily work with and distribute ATMs from the four main ATM manufacturers: Hyosung, GenMega, Triton, and Hantle (formerly known as Tranax). We also have experience managing ATMs from other manufacturers such as Diebold, Tidel, WRG and others. If you would like to learn more about our different ATM models available, check our ATM gallery. We specialize in placement and distribution of standaone ATMs, perfectly suited for interior locations in retail environments. We offer many different standalone ATM brands and styles so you can get the exact features you’re looking for. We also offer through-the-wall ATMs, wall-mounted ATMs, and countertop ATMs. Upon request, we can provide an impressive list of references with big-name marquee venues and well known national brands; a veritable “who’s-who” of venues that includes a very large convention center, a very busy auto racing track, a college football stadium, a college basketball arena, festivals, shopping malls, well-known hotel brands, and many more. Whether you need ATM placement and management where we take care of everything from “soup to nuts” or you already own ATMs and just need basic repair services, we are flexible and can accommodate the needs of most clients. We can custom tailor a program based on what you want. We don’t only work one way. We like to be agreeable and will be open to what you propose. Over the years we have expanded in all directions to include local division offices in our busiest markets in various major cities across the country. To the west and southwest we have division offices in Las Vegas, Los Angeles-Orange County, San Diego, San Francisco, and Phoenix. To the south we have covered the Texas Triangle megaregion including: Dallas-Fort Worth, Houston, San Antonio, and Austin. To the east we have division offices in Boston and Louisville. To the north we have recently opened our market for Minneapolis-St. Paul, Minnesota. We also have offices in cities nearby including Omaha-Council Bluffs to the north and to the west in Denver, Colorado Springs and Fort Collins. In addition to these major markets, we offer ATM service and sales in every metropolitan area and major city in all 50 states. Each circle on the map represents a city where the local ATM technician lives. Each location has a service area with a 50-mile radius, though many technicians will drive farther, this is a general rule of thumb. As you can see our coverage is very thick in all urban parts of the country. For those establishments looking for an ‘upscale’ appearance, such as luxury hotels and other high-end establishments we offer premium wood cabinets to blend in with almost any decor. 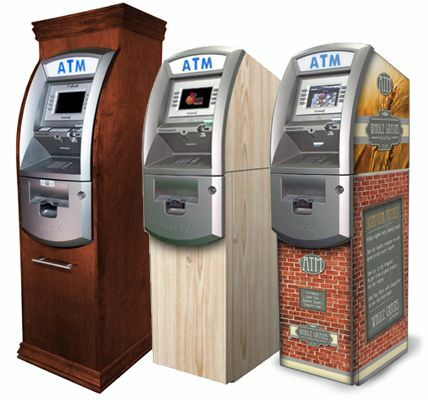 We can also get your ATM wrapped with a wood grain textured vinyl skin that is both scratch-resistant and UV-protected. To match your exact decor there are several wood grain options available, including: maple, cherry, mahogany, pine, poplar and many more. An ATM wrap can also be custom-designed with your brand logo and preferred design to turn your ATM into a high-quality visual branding tool . Studies show ATM branding can increase transaction volume by as much as 20-40%, depending on the location. When selecting an ATM company, reputation should probably be important. Or at least we think so. That is why we are an accredited member of the Kansas City BBB. And we are proud to have earned an A+ rating. We have pledged allegiance to the code of ethics for over 5 years with no complaints and earned the highest possible rating, the prestigious A+ rating. We attend industry conferences like ATMIA and NAC to meet other ATM operators and continually work on developing our partner network so we can get to most places in the country and service organizations with multiple locations. We have one of the largest extended networks in the country. When selecting an ATM company, we know that commercial insurance is important. Since we work with several large clients that have high supplier/procurement/sourcing standards, we have to carry auto and work comp insurance as well as general liability insurance. Our clients can be listed as an insured party on our insurance if needed and Certificate of Insurance available upon request. Making sure ATMs are always up and operational around the clock is important for busy locations. We monitor ATM status to keep an eye on any alarms and watch the cash levels to ensure it never runs out. The network operation center and processing technical support are on the job 24/7/365. As we mentioned earlier in this post, we have multiple cash vaulting service relationships so not having enough vault cash is never a problem. To illustrate this point, consider the example of the largest convention center in Kansas City. In 2012, an event organizer called us and said the Missouri bank with the ATMs in the convention center ran out of money and they couldn’t load more on the weekend and the event majorly suffered from lack of cash. So in 2013, we brought in 7 temporary ATMs to service this event (which is the largest of all events at the convention center). We did such a good job taking care of the event, the convention center noticed and decided to switch to Prineta for permanent installation and full time management of the ATMs. In 2015, this event went through over $200K in 3 days. Another good example is the Speedway; 6 ATMs supply cash for close to 70,000 people during NASCAR weekend. If the vendor you are currently using doesn’t have enough cash to supply your event and/or cannot load or respond to service needs on the weekend, it might be time to find a new ATM management vendor. Assumedly, you already knew that and that is why you are reading this post. If you like what you have read so far, keep reading. 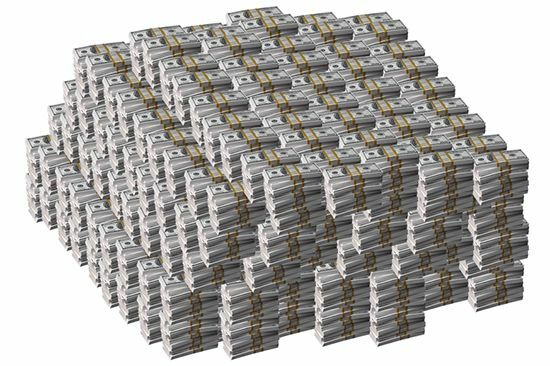 Sometimes the needs of our clients require armored carrier cash loading for volume, security, or other reasons. No problem. We have multiple cash vaulting service relationships that include options for Loomis, Brinks, Dunbar, Garda, and other armored carriers. When cash logistics are extremely important, we bring in the armored carriers. While any merchant can attempt to work with an armored carrier directly, most realize they also need an installer and technician that can come fix any basic problems which they can’t fix themselves such as bill jams, network connection issues, a reset after a power outage, a card stuck in the card reader, etc… They therefore find it smarter to partner with a company like Prineta that can provide a turnkey solution that includes everything you need; both a technician and the cash management. Easier to manage and more reliability. We have experience servicing large crowd public venue events. Above you read about the convention center. As the ATM provider at large convention centers, busy arenas, stadiums, race tracks, large hotels, and airports we understand the needs of large crowd venues; large load amounts, multiple machines, priority wireless connectivity, and less than 1 hour on-site response times during scheduled large events. For venues, we offer turnkey managed ATM services where we provide new ATMs, load sufficient cash for events, and provide local service/support (featuring 1 hour break-fix SLAs during scheduled events utilizing multiple local technicians. 1 hour break-fix SLAs during events is what separates the professionals from the amateurs, something that differentiates Prineta and further substantiates our “best in class” claims. If you are having a big event, you can’t be having your ATM go down for more than an hour. We know this and build a plan to provide 1 hour response times for our venue clients. We have experience servicing regional banks and credit union clients. Managing ATMs is not easy and often requires banks to hire full time W2 employees to manage everything. Depending on size of the ATM operation, it may be cost prohibitive if you factor in salary and benefits and taxes and overtime pay for weekend work and all of that. For many smaller and regional banks, it makes more economic sense to outsource the ATM management. Our big processor partners have experience in this area and this is an area where we plan to focus and grow our business going forward. We should be able to meet most all sourcing/supplier requirements. We have relationships with large field-force technology deployment companies for 100% reach. The costs can be slightly higher, but if needed because we do not have a local ATM operator partner in a given market, we can subcontract with a company that specializes in technology deployment to have the ATM installed and serviced. As we started expanding our service areas, we realized that we may not be able to find a local partner in every single city out there, and sometimes we will need to partner with a nationwide technology deployment type company to “fill in the gaps”. These are technicians that may not specialize in ATMs but can install an (staged and pre-programed) ATM according to our “ATM Deployment Requirements” with some guidance and support from our team at headquarters. These technicians typically install computers and networking equipment and copiers and POS systems and things like that and are fully capable of unboxing the ATM, finding power, bolting the ATM to the floor, and doing a test transaction. We can also use these technicians for things like re-programing ATM processing, fixing a bill jams and other maintenance and repair type things; they can be our hands and feet onsite while we tell them what to do over the phone. The key here is the experienced tech support staff at Prineta that can guide the tech through what needs to be done. That is unique to Prineta and yet another thing that differentiates us from other vendors. Or if your organization has someone handy, you can arrange to have the ATM installed by your people; that’s fine too (and cheaper). At Prineta, we are goal-oriented go-getters that have always known we wanted to be a nationwide ATM company and we knew we needed to build a large network of partners if we are going to be able to live into our vision. So from the very beginning, we have been diligently building an impressive network of independent ATM operators that we can partner with to service the needs of clients with multiple locations. Our first partner relationship was with the largest independent ATM operator in the country (at the time) that was managing 55,000+ ATMs and they introduced us to local ATM guys in other markets so we could build alliances. Our second partner relationship was the largest independent ATM operator in Kansas and Missouri that was managing over 500 ATMs at the time and they mentored and supported our operations in Kansas City. Our first expansion markets were Las Vegas and South Florida in 2010. It took us a couple years to figure everything out; we had to work out the partner agreement contracts and define all the processes between our two companies for placing orders, scheduling installations, managing cash logistics, and on-site maintenance dispatch (with same day emergency service for big events and next day service for most other locations). Over the last few years, we have been attending industry conferences like ATMIA to meet other ATM operators and we try to add new partners/markets regularly. Six years later, we have the business model nearly perfected and have substantially grown the number of partners to the point where we can get to most major markets across the country through our extended network. We now have dozens of ATM ISO relationships and very good relationships with the two largest processors in the country, both of whom always connect us with their local ATM operators whenever we need to cover new cities. Even if we don’t currently have a partner in a given city, we know how to find potential partners and quickly add them to our network. In many ways, we are like an aggregator. If you add these connections together, that means we have the largest network of local ATM operators of any ATM company out there.Our corporate office is centrally located in Kansas City where we are the predominant local ATM company. If you have multiple locations and prefer to hire one ATM vendor to handle all of the ATM management needs at all of your locations, then you need an ATM management company that provides service nationwide. That is probably obvious. If you manage a large crowd public venue, then you need to find an ATM company that is experienced in large events with the scale and money supply needed. Again, that is probably obvious. But what is not obvious is finding a good quality company that can actually do what you need that would be a good partner for you. Some of the biggest ATM companies out there only do technology and don’t always offer field service work. Others may be small-time independent operators that only operate in one or a handful of cities. A well-capitalized, medium-sized independent ATM operator that can manage everything in multiple cities is probably going to be what you need. Fortunately Google knows that Prineta is one of the top-10 most relevant sites for these types of ATM services and you are in the right place. We are glad you are here. ATM services and management is what we do, nationwide; and we would like to be your ATM company. When you have a single location or many, please use the contact form at the bottom of this page if you are thinking about selecting a new ATM partner or procuring ATM services. At Prineta, we have the people, experience, scale, money supply, and insurance needed to not only meet but to exceed your requirements. While we service all types of ATM needs, we specialize in large events for conventions and festivals and managing fleets of ATMs for chains and property managers. When it comes to ATM machines, we can do everything; we are like a “one-stop-shop”. 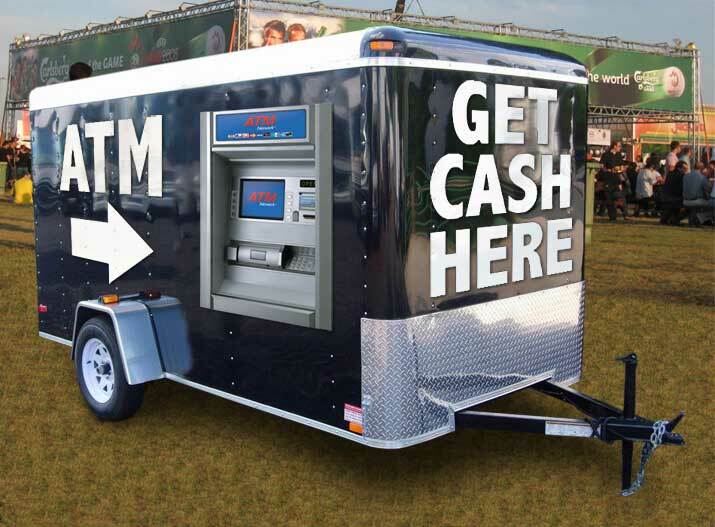 For large outdoor events like festivals, we often bring out the mobile ATM trailer and typically place it where the biggest crowds gather; near the main stage in close proximity to the drinking establishments and vendors. For both indoor and outdoor events, we typically bring in additional standalone ATMs and strategically place them throughout the venue in the most convenient places (and near where cash is needed). Most ATM companies out there do not have a mobile ATM trailer, but we do; and this is yet another capability that differentiates Prineta and why you should go with Prineta for all your ATM needs. Unlike other ATM companies who require lengthy 5-year or even sometimes 10-year contracts in order to place and manage an ATM, Prineta does not require a contract be signed to provide our services! For those businesses who do prefer to have a service agreement in place, we offer simple, one-page service agreements which can be executed with only a couple clicks via Adobe Sign. We can execute it the old-fashioned way or we can do electronic signature with Adobe Sign. Either way is fine, just let us know your preference. Thanks again for visiting our site. If you would like to request a proposal or ask a question, please enter your contact information into the form below and we will try to call you back and e-mail you right away. Be sure to include some information about your location(s) that need ATM services and what specifically you need.